Maybe, Epictetus was right when he said this. We blew through September, which is a month where even the most southern parts of Germany (where I'm from) send all their boys and girls back to school. To learn something new every day and most importantly grow a little more. The picture to the right is on of the famous German school cones ("Schultüte") which new pre K students get for their first day. It is filled with all kinds of presents and candy. In the same vein, this monthly Tech Digest brings you the latest news around Scala, Akka, Lagom and Play. A big thank you to this awesome community for all your contributions! To help us amplify the news, articles, guides, and how-tos out there, feel free to reach out on Twitter at @myfear to point me towards relevant resources. Now it’s time to sit back, grab a coffee and relax while you read through this month’s highlights! 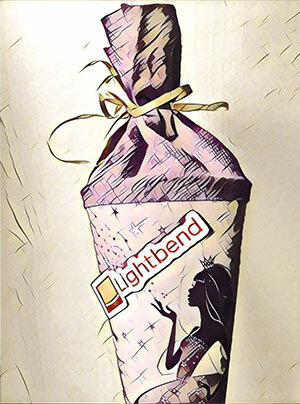 Lightbend’s active and rapidly growing community sponsors meetups and conferences online and all around the world. Our engineers and professional services representatives travel the globe to share insights about Play Framework, Akka, Scala and other projects. Browse our list of conferences, meetups and webinars. Thanks for reading! To get the freshest updates, follow @Lightbend, @AkkaTeam, @Lagom, @playframework, @scala_lang and @scala_sbt on Twitter.